Chetham’s School of Music in Manchester (UK) has been undergoing a complete renovation over the past few years. The world-renowned specialist music school’s state of the art new school building was completed in 2012, and just this week the latest addition, The Stoller Concert Hall, (pictured above) will open its doors. Intended for professional touring artists and for Manchester’s professional and amateur musicians, Stoller Hall will host a dynamic, imaginative programme of music and spoken word. I had the pleasure of visiting Chetham’s School a couple of years ago and thoroughly enjoyed a tour of the stunning new building; airy teaching and practice rooms offer students a wonderful setting for their musical education, and the attractive capacious central atrium is imposing. Stoller Hall will no doubt complete the metamorphosis of this much-loved institution. 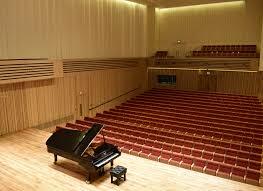 Chetham’s also provides the setting for the Chetham’s International Summer School and Festival for Pianists. Held annually, the visiting faculty boasts some of the finest pianists and pedagogues in the world, and this vibrant, respected and inspirational Summer school offers many wonderful opportunities for both amateur pianists and young professional players. The Summer school also hosts the Manchester International Concerto Competition For Young Pianists. In its fifth year, the competition will be held from August 23rd – 29th 2017. Six finalists will perform a concerto of their own choice with Manchester Camerata, the internationally renowned orchestra regularly accompanying Marta Argerich! All pianists under the age of 23 who have concertos in their repertoire (or who plan to learn concertos from the repertoire list) are strongly encouraged to apply. All they need to do is submit a concerto recording online by 4th June 2017. The recording can be from a live orchestral concert or two piano performance. Unaccompanied performances are also accepted. A maximum of 21 performers will be selected for the semi-final round of the competition, which will take place in Stoller Hall at Chetham’s School on 25th and 26th August 2017. Semi-finalists will be required to perform their complete concerto from memory with a second piano accompaniment of the orchestral part. Official accompanists will be available, though all candidates may, if they so choose, use their own accompanists. The final will take place at 7.30pm in the Stoller Concert Hall, Chetham’s School of Music on the 27th and 28th August, and will be conducted by Stephen Threlfall. This is sure to be an exciting event for participants and music lovers everywhere.